Book your favorite apartment online, anytime day or night with ease. We are looking forward to welcoming personally to Oberstdorf very soon. EVERYTHING centers on winter sports in the cold season. With winter sporting events like the four-hills ski jumping tournament, skiing, snowboarding, sledding, cross country skiing or winter walking – the possibilities seem unlimited. Enjoy our movie! A spectacular new day – a stunning new mountain! Every day is truly an unforgettable experience. In the months of May until October, you will receive free mountain railway tickets for the mountain railways in Oberstdorf daily, as well as to the nearby Kleinwalsertal (Little Walser Valley). In winter you will profit from discounts. 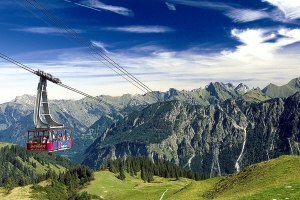 Between May and October (depending on the opening hours of the mountain railways) you will get free mountain railway tickets for all gondolas in Oberstdorf and the nearby Kleinwalsertal (Little Walser Valley). Experience a different mountain each day with a savings of up to € 34,50 per person. Enjoy an eventful winter walking-tour with the most beautiful winter backdrops to the peaks of the highest mountains in the Allgäu. A well-groomed sunny, winter, hiking path on the Ifel Mountain is a great example of an experience awaiting you. You will see the impressive plateau “Gottesackerplateau” and the majestic scenery of the snow-covered mountain tops. Just ask at the reception for the discounted mountain railway tickets. For example, you will receive a hikers ticket to the Ifen Mountain, which is a savings of € 3,50 per person. Instead of paying € 19, it will only cost you € 15,50. Decide spontaneously and buy the discounted mountain railway tickets on-site at the reception of the Oberstdorfer Ferienwelt. Detailed information to your winter walking-tour is certainly inclusive!